This tutorial will teach you how to use WinSpeedUp for the first time. 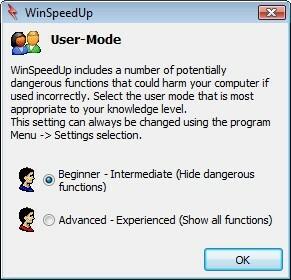 It will assist you by choosing the proper parameters which are set-up when running WinSpeedUp for the first time. WinSpeedUp will show a small splash screen and tells you that it is loading its settings. 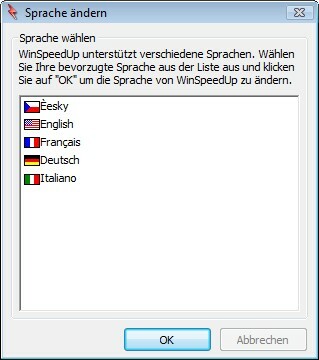 The second window appearing allows you to choose your preferred language of WinSpeedUp's interface. This window will be in German or English, depending on the language of Windows. Note: On the screenshot you see the dialog on German because my Windows is a German Windows. You can always change the language of WinSpeedUp by clicking on "Menu", "Settings", "Change Language..." in the main window. The third window lets you set-up the User-Mode. Choose your knowledge level about computers here. If you are unfamiliar with all the technical details of computers, you should choose "Beginner - Intermediate". This will hide all dangerous functions in WinSpeedUp to prevent you from destroying your Windows configuration by choosing wrong settings. Only very experienced users should turn on the Advanced mode! Click on "OK" to save the User-Mode level. After having chosen the User-Mode level, SettingFreeze will appear. 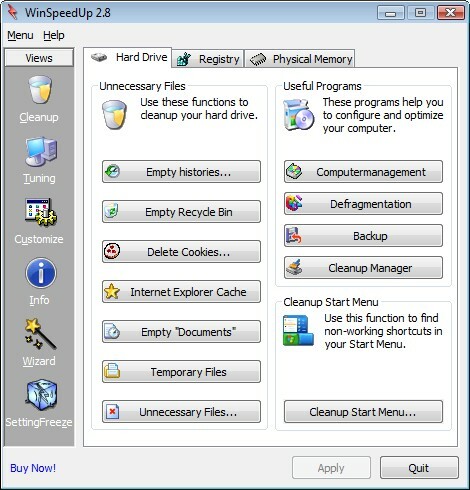 This is a sub-program of WinSpeedUp which lets you manage backups of your Windows configuration. 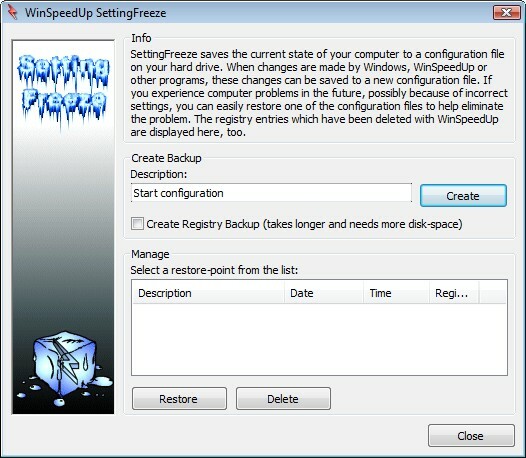 When running WinSpeedUp for the first time, SettingFreeze will ask you to create a backup of your configuration. This is useful if you do any mistakes when configurating Windows using WinSpeedUp, and you want to restore your old settings. Click on "Create" to make a backup of your configuration and close the window when WinSpeedUp has told you that the backups was created successfully. If you like, you can include a Registry backup. This is useful when the Registry gets damaged (which is very uncommon). You can always start SettingFreeze to create new backups or restore a backup by clicking on "Menu", "SettingFreeze" in the main window of WinSpeedUp. This window will appear only if you have not yet purchased an unlock-code. It reminds you of the limited shareware version. 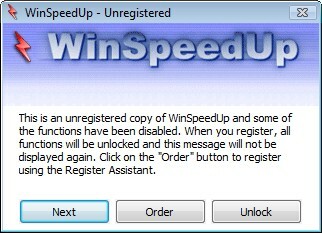 Click on "Order" to purchase an unlock-code for WinSpeedUp and to use all functions. In the Shareware version some functions are disabled or limited in their usage. If you have received an unlock-code from us and have not yet entered it, click on "Unlock". To start WinSpeedUp, click on "Next". This is the last step in our tutorial. You have successfully configured WinSpeedUp and can now use all the clean-up and speed-up functions! All functions are described in the manual. To get help to a specific topic, simply press the F1 key in WinSpeedUp. Have a look at the other tutorials to learn more about interesting functions of WinSpeedUp.